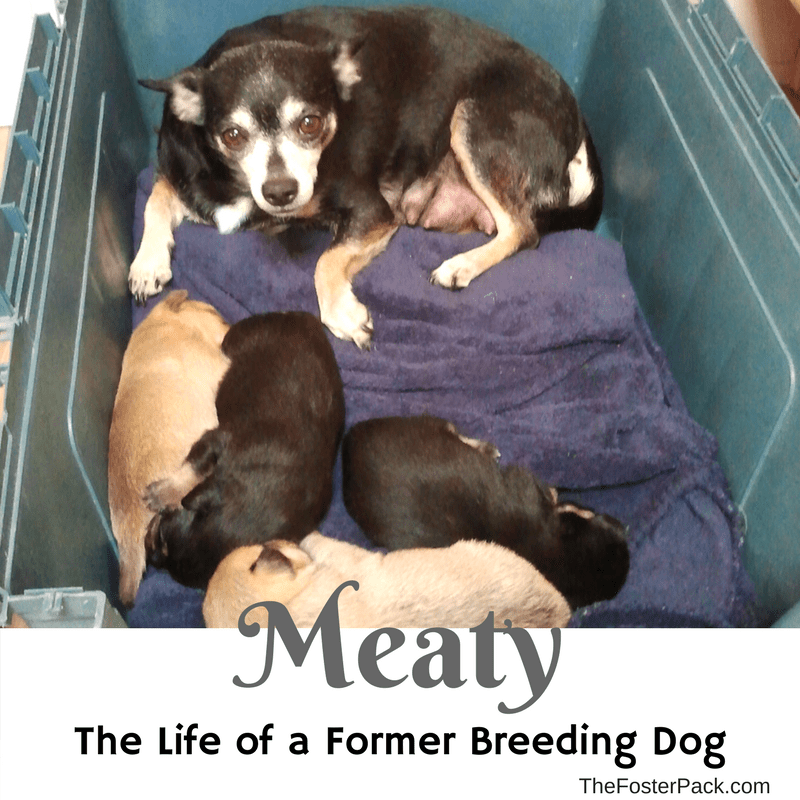 She was used for breeding for the first seven years of her life. Approximately 2 litters of puppies a year, since she was about a year old. So probably at least a dozen litters of puppies she birthed and raised. The poor little girl. She was surrendered to the dog rescue by her owner’s friend/neighbor, with a litter of just days old puppies, when her owners went to jail. She and her babies came to stay with us while they grew up. They were our first litter of puppies ever. And it was quite a learning experience for us. Three years ago today that last ever litter of her puppies left for their new homes. We decided to keep her. Due to her age and color, she would have had a harder time getting adopted. Meaty’s life has been a lot easier since her retirement. She was spayed just days after her babies left so that she never has to worry about raising more babies. Now she spends most of her days relaxing on Sister’s bed. Bossing around the big boys. Trying to stick with her exercise program to get back her girlish figure. And snuggling with whichever family member has a free lap. Yep, life has gotten a lot better for our little Meatloaf. She’s apparently had enough of puppies, as she avoids all litters of foster puppies when we have them. She’s not even a big fan of Cami, who is growing up so fast. But we love her dearly, even if she doesn’t enjoy foster puppies as much as we do. 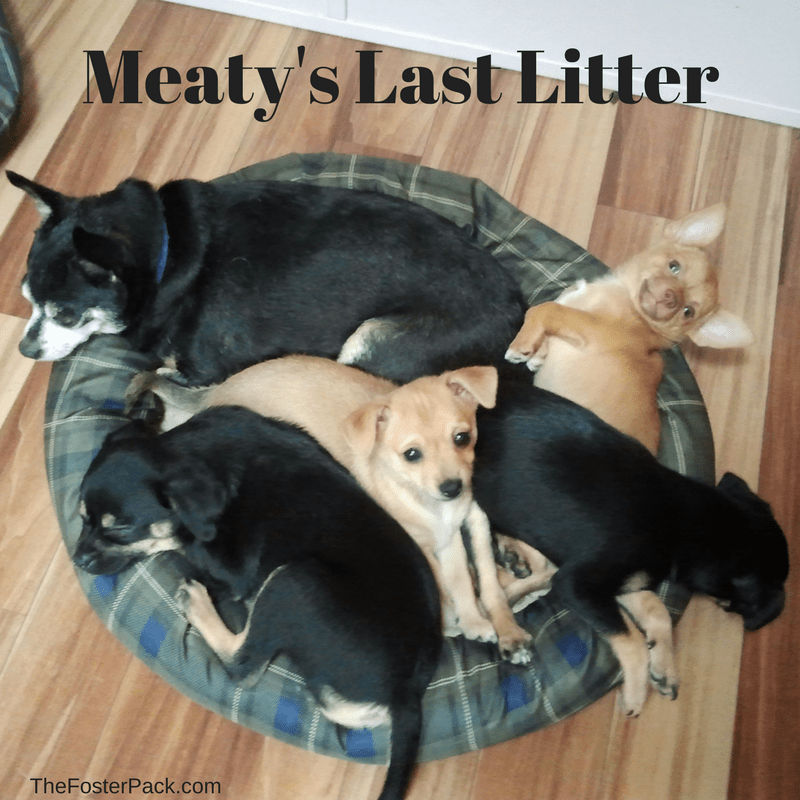 Meaty got lucky when she was surrendered to the dog rescue, and came into our lives. But most dogs used for backyard breeding don’t get that lucky. When they’ve outlived their usefulness to their horribly selfish owners, they’re often dumped at high-kill shelters. Or simply abandoned somewhere. Or even killed. Then there are the poor puppy mill breeding dogs, and they rarely make it out alive. It’s not a good life for any of them.